Hair Extension Tips | Stylistic Inc. While many women enjoy wearing semi-permanent hair extensions, others enjoy clip in extensions, which can be taken in and out with ease. 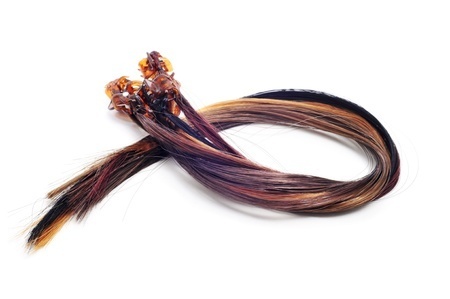 Clip in extensions are a good option for first-time extension wearers. These easy to apply hair pieces will give you the opportunity to experiment without commitment. Also great for women looking to change up their style and add volume to their hair for big events, clip in extensions must be stored properly to maintain their healthy, tangle-free appearance. As you prepare your extensions for storage, we recommend taking some time to wash and dry them properly. Styling products and oils from your hair can cause damage to your extensions if left on them for a long period of time, making washing an important first-step of storing your hair extensions. Wash your extensions, using a wide toothed comb to de-tangle hair. Blow dry natural human hair extensions or allow them to dry thoroughly on their own. Making sure the hair is dry is a very important part of storage, since storing damp hair can cause mold and mildew to grow. There are many storage options available for hair extensions, from the container your extensions came in to an old shoebox. While these options are fine for short-term storage, the best idea for long time storage is an air tight container that provides plenty of room to keep your extensions from tangling. After placing your hair extensions in storage, it’s important to find a good place to keep your hair piece. Discoloration can occur if your extensions are left out in a sunny spot, so we recommend choosing a cool, dry location to keep your hair looking its best. To learn more about caring for hair extensions and to find the right type for your lifestyle, contact Stylistics, Inc. today! Call us at 602-234-3381 to schedule an appointment.